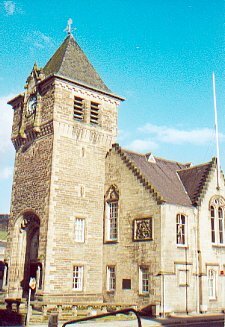 A town in the Scottish Borders, Galashiels lies near the junction of the Gala Water with the River Tweed, 28 miles (45 km) southeast of Edinburgh and 5 miles (8 km) north of Selkirk. In mediaeval times there was a hunting tower near here at the heart of the royal forest of Gala and Leader and huts or shiels by the river are said to have been used by pilgrims on their way to Melrose Abbey. Erected into a burgh of barony by the Pringles in 1599, Galashiels developed in association with the textile industry. The granting of the burgh charter is an event celebrated annually at the end of June by the Braw Lads' Gathering, a week-long festival established in 1930 as a variant of the Common Ridings which take place across the Borders. The town's coat of arms incorporates a fox attempting to reach plums on a tree, with the motto 'Sour Plums', an image that commemorates the story of a group of English soldiers killed in 1337 after stealing plums. About 1780 a new settlement closer to the river was laid out by the Scotts and new mills were built. By 1882 the population had risen to 17,000 and there were 21 mills in the town which had been granted the status of a Parliamentary Burgh in 1868. In 1909 the Scottish Woollen Technical College was established, but by then the textile industry was in decline. From 1998, the College became a campus of Heriot-Watt University. The railway that had served Galashiels since 1849 was eventually closed in 1969, however a new station opened in 2015 to serve a rejuvenated Borders Railway. Food industries, pharmaceuticals, electronics, information technology and the manufacture of leather clothing provide employment. Buildings and monuments of note include Old Gala House (1583), a former residence of the lairds of Galashiels, the Peter Anderson Woollen Mill and Museum and the fine equestrian statue of the Border Reiver by Thomas Clapperton (1879 - 1962), a native of Galashiels.